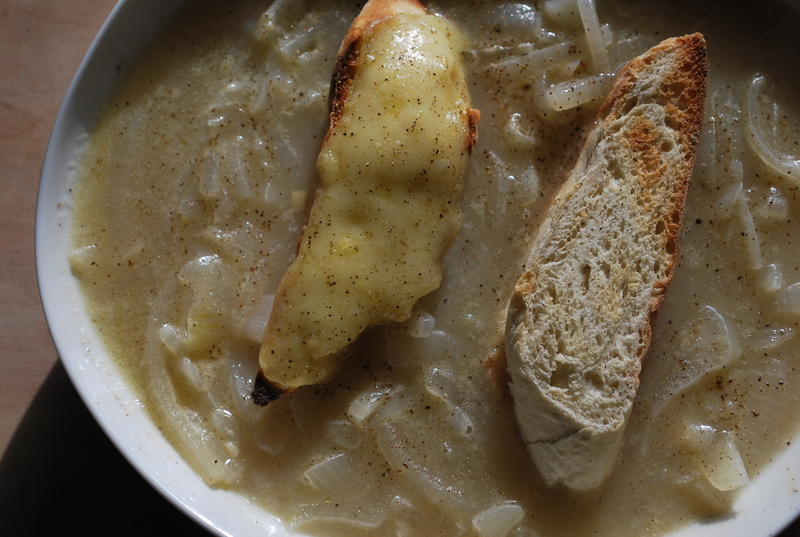 This is a white, light, almost refreshing French onion soup in contrast to those we usually encounter that are dark, earthy, and heavy. I enjoy both. This one is great for a light lunch, or a true souper like my grandmother used to have on the farm. Since the kids still adore cheese, I simply floated the toasts on the soup – gruyère toasts for them and plain toast for Andrew and me. Let’s be honest, some people eat French onion soup for the cheese but do they really need a pound and a half dripping off the side of the bowl? Heat the olive oil in a heavy dutch oven, add the sliced onions, bay leaves, and thyme. Cook over medium heat until soft, almost translucent and and slightly sticky. Once done, add the flour, stir thoroughly, and cook for a couple of minutes. Pour in the wine slowly, stirring well, so you get a nice smooth base before adding the stock. Add the stock and stir well. Bring to a boil, season with salt and pepper, then simmer over low heat for about 30 minutes. Add the white sherry and continue to simmer for another 10 – 15 minutes. Remove bay leaves. Meanwhile, toast the baguette. Set plain baguette slices aside until soup is ready. If using cheese, place sliced gruyère on the toasted baguettes and melt under the broiler. Check soup for seasoning. Add to individual bowls. Float toasts on top of soup and serve immediately.